The impact of carbon prices on consumer behavior is a central element in current policy debates dealing with mitigation of greenhouse gas emissions. We examine the impact of British Columbia's carbon tax on private automobile gasoline use. We control for several factors that influenced gasoline demand during our study period, including local public transit improvements and increased cross-border shopping. Our results suggest that a 5 cent per litre carbon tax reduced gasoline consumption by 8%. We find that households residing in Vancouver and other cities responded to the carbon tax, whereas households in small towns and rural areas did not respond. We perform several sensitivity analyses. Even our most conservative lower bound estimate suggests that a 5 cent per litre carbon tax reduced gasoline consumption by 5%. 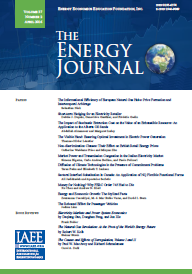 Published in Volume 39, Number 2 of The Quarterly Journal of the IAEE's Energy Economics Education Foundation.